Fred Thomas has a thing about the season. While in garage-pop torchbearers Saturday Looks Good to Me, he titled an album All Your Summer Songs, after all. The prolific Michigan musician’s latest project, Swimsuit, yearns as usual for warm weather and sandy shores, giving his latest songs the sort of urgency that California kings of the beach may never understand. The band’s self-titled new album is full of sweet melodies turned bitter by ragged vocals and major chords and surf guitar leads played a touch too fast. In that sense, it’s a darker effort than last year’s largely acoustic Mighty Clouds album, if one more indebted to the Vitamin D riffs of the early Beach Boys and their colleagues. As more gimmick-driven bands sail around the world and smoke pot with their cats, for Thomas, any coast is the best coast. He’d just like to be there. 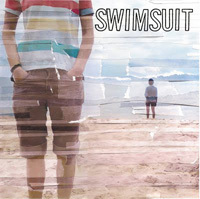 Swimsuit is out now on Speakertree Records; stream it in full after the jump.